Woke up yesterday around 9, and happened to glance out the window that overlooks the little courtyard that I share with three or four other apartments, as two men were decapitating this sheep with a stout axe. I watched transfixed from my window as they hacked away at it’s head; they noticed me watching and beckoned me down. Grabbing my camera I joined them outside. It turned out that they needed a better knife–so they rifled through my cutlery drawer and selected a sharper one, seen here resting on the sheep’s head. The guy on the right is Paata, the head of the family who live next door. The occasion, I later learned, was his sister’s birthday. As far as I could make out, he lives there with his wife and two children (a boy of 12 and a girl around 11), and his wife’s parents, a plump and benevolent-looking matron and a stocky grey-haired man with a humourous glint in his eyes. 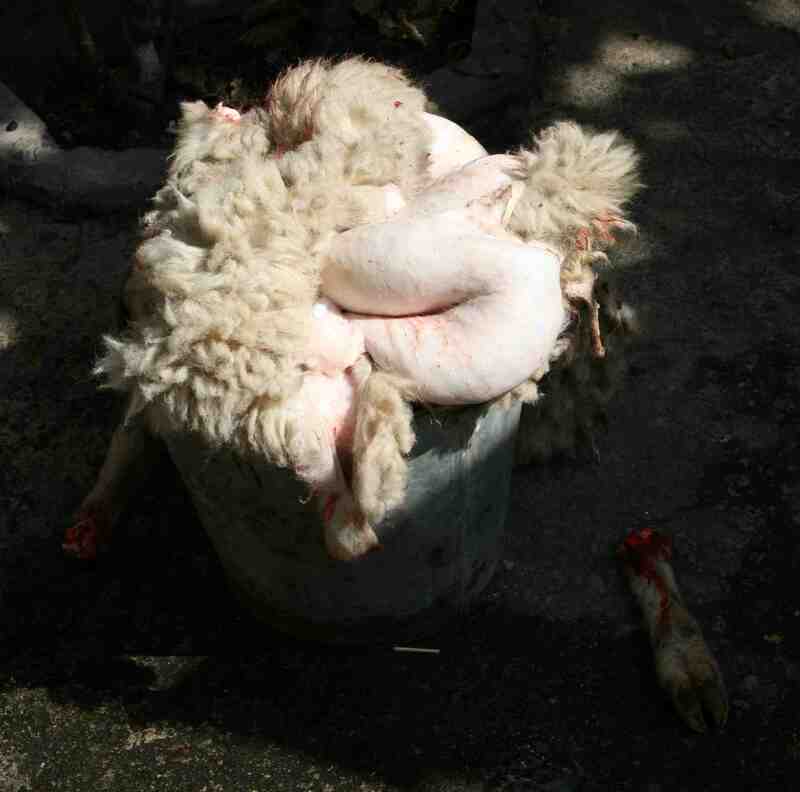 The other fellow in the picture is a friend of Paata’s, an expert butcher who handled all the preparations. 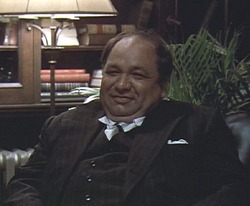 Short and stout with a well-developed hemisphere of a belly, he looked quite like Peter Clemenza. 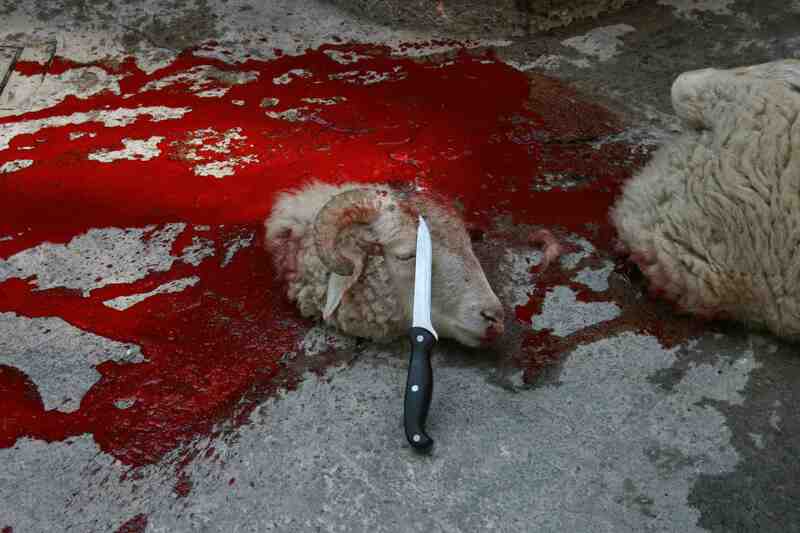 He certainly made short work of the sheep. Once they’d gotten rid of the head and let it bleed, they strung it up by one hind leg on a clothes-line hanging from a balcony above. From its gullet poured out a mess of foul-smelling, semi-digested grass that looked like watered-down pesto. Clemenza didn’t seem to mind; he just continued cutting away the sheepskin, marching around in it and getting it on the hem of his trousers until Paata’s wife protested at the smell and washed it away with some water. 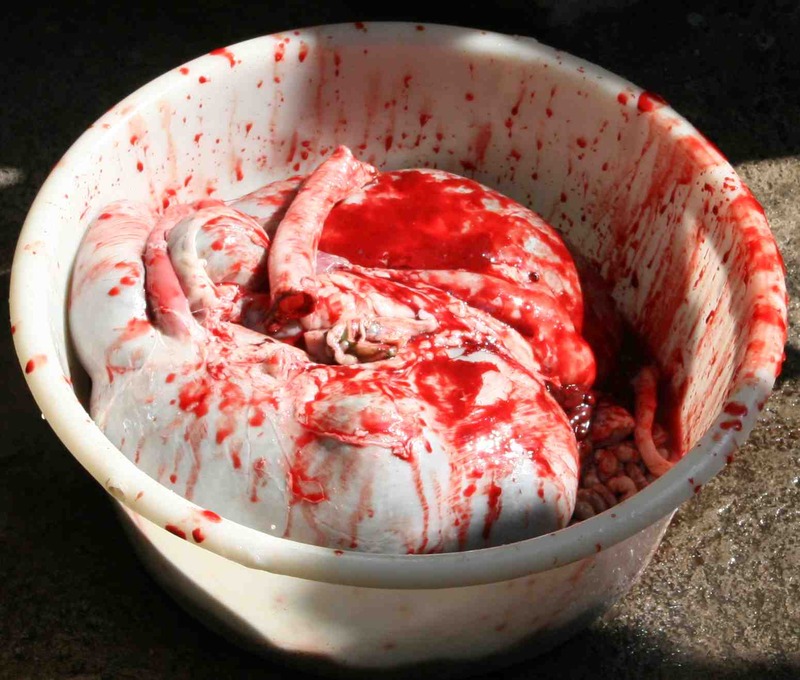 Once they had removed the skin, he cut open the belly and the guts sagged out, twisted curling entrails and a large distended stomach; then he reached in and pulled out a cluster of organs, all held together by a network of membranes. 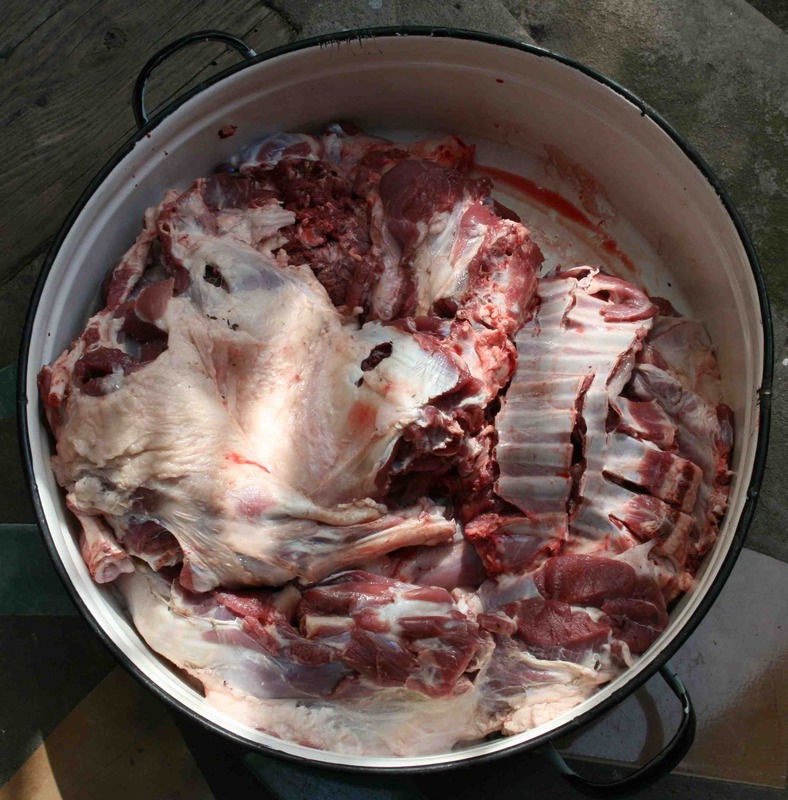 Bit by bit they cut it up, until they had a large pan full of expertly butchered mutton, another filled with bloody entrails, and a bucket with the pelt. Awesome story. Did you get to eat any? What is the name of the expert butcher?